Some people shelve their books by color. I wish I were that creative. Instead my books sit on the shelves in boring alphabetical order–by author’s last name. When I first organized them years ago, I tried not to squish them so I would have room to add more. Eventually, though, the shelves became full. Then I began to lay books horizontally across the place they should be. Every few years, I dust, add the horizontal books, and expand forward onto a new shelf. Only books I’ve read go on the built-in shelves. The ones I haven’t yet read used to go on the floor, but now go on this very cool skinny bookshelf from Design Within Reach. It’s free-standing, and the books go on it horizontally. For a picture, look on my Reading List page. I tell myself I can’t buy any new books unless there’s a place to put them on this bookshelf, which currently holds 87 books and is full. As I look around my study now, the horizontal spaces are almost full as well. It’s getting to be that time, but I’m running out of “new shelves.” So not only is it that time, it’s also time to weed/cull/purge. Last November in The Well-Tended Bookshelf, Laura Miller wrote that there were “two general schools of thought on which books to keep”: you are what you’ve read or you are what you will read. Either way, the bookshelf serves as some sort of self-portrait. Anna Quindlen wrote, “The purse is the mirror of the soul.” Yes, so also is my bookshelf. Really? I ask myself. Maybe. On Bibliobuffet, I found a link to a blog about bookshelves. Bibliobuffet also lists 17 organizations where you can send books you no longer need or want in your libraries. You can also exchange books on BookMooch. How do you shelve? Do you keep all your books? Even though I got an eye twitch looking at your un-color-coded bookshelf, I know that alphabetical is best. You’ll always be able to find what your looking for in seconds, rather than hours like I do. example: Recently on an agent blog, he recommended some books he’d read. I wrote them down since I may query him one day. Then I ordered them from the library. It wasn’t until I recieved them that I realized I already had them. I would have known that if my bookshleves were user-friendly. Yes, the same thing happened to me a couple of years ago, but the book I rebought was stacked up on the back row on the floor under the desk where I kept all my to-be-read books–hence the new bookshelf. BTW, thanks for the inspiration on the shelving by color! Did you check out the cool links in the first sentence? Oh, my! If my bookshelves are the mirror of my soul I’d better take a closer look at what books I’ve kept. 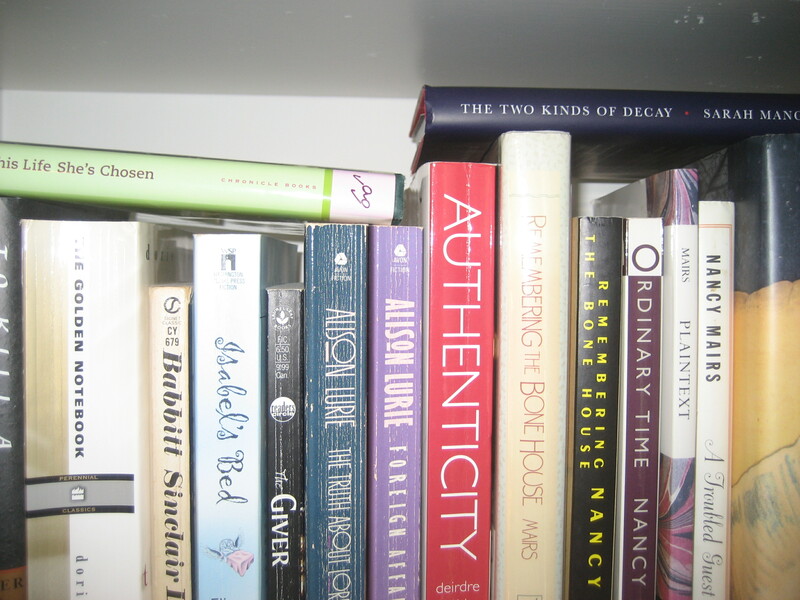 My fiction is in alphabetical order by author, with non-fiction sorted by topic. And I too have many books stored horizontally awaiting more shelf space. My budget is limited, so I usually “audition” new (to me) authors by library loan and then buy those I know I’ll want to read again. It’s hard for me to get rid of books, even those I didn’t like. I tend to think the fault was mine and I should read it again. I never thought about sorting nonfiction by topic. I just threw them in there with the rest. Although now that I turn my head to the right, by my desk, I have a shelf for poetry and a separate shelf for books on writing craft. I always thought I had no order to my bookshelve whatsoever, but you made me realize this is not so! My books are organized by size. The heaviest textbooks are at the top, which makes no sense, but I suppose they’re up there because I do not reference them much anymore. I find myself buying fewer books in recent years for the reason that I would need a secondary house to keep all the books I read. Thank goodness for libraries! I had to buy a ladder for my study because the A’s are on one of my top shelves and the H’s on the other one! I’m not sure if I’m buying fewer books, but I know I’m being more selective. I used to automatically buy the next book by an author I had enjoyed reading. Now I do a little more investigation. Erin, it’s nice to hear from you again! What are the different genres you have? I just realized a minute ago that I do separate out poetry and books on writing. And I gave away a book last week that’s been b o t h e r i n g me because I have the other books this author has written. I actually wondered last night if I was going to have to buy it again! Categories are pretty loose – fiction (which is further divided into silly and more respectable fiction), biography/memoir, classics, foodie/wine books (one of the biggest categories for me), and then reference. I ended up getting rid of books that I felt like didn’t really have any meaning, or that I didn’t learn anything from. I had a pretty large collection of Chick Lit – a lot of which I really love and connect with – but some of which were just badly written, so I got rid of some of those. Also, a few Grisham/Clancy-ish things, and a few books that I hadn’t read and knew that I wouldn’t. I have a weird problem with having books on my bookshelf that I haven’t actually read – it makes me feel like a poser. I love your fiction categories–silly and respectable! That’s great. I wanted to separate biography/memoir just like I do poetry, but so many of my favorite fiction writers are now writing memoirs as well and I wanted to keep all books by the same author together so there went that idea. On a side note – does anyone else LOVE the new trend towards memoirs of the last few years as much as I do? I can’t get enough of them. At least every third (maybe even more) book I’ve read for the last few years has been some sort of memoir. If you ever feel the urge to delve thoroughly into this topic, I recommend (if you don’t already know it) Henry Petroski’s The Book on the Bookshelf, a history and examination of the bookshelf as it developed in the Western world. There’s an entire appendix on different organizational principles of shelving! I’m a traditional author’s-last-name kind of girl, like you, with a separate to-be-read shelf. I also have separate sections for poetry (alphabetical by author’s last name), art books (alphabetical by artist or museum), instructional & reference books (not really organized at all, as I’m continually taking them out & putting them back), and nonfiction (alphabetical by title, since often I don’t immediately remember the author’s last name). My to-be-read shelf is nowhere near as cool as yours, though. Thanks for the link and the great review of the book. My art books are stacked horizontally around my study and in other rooms. Now I want to gather them all and organize! I can’t part with books without feeling like I’ve torn out an internal organ, unless I absolutely hated the book. My solution to this hoarding is to constantly lend books to friends. This way, my shelves stay manageable, and I know my little friends are safe with a trusted friend–they are just on “vacation.” Am I weird or what??? Well don’t feel bad. Isn’t mess associated with creativeness? And yes, it’s so hard to give a book away. I’ll hold it in my hand and think, am I ever going to read this again. Then I start turning the pages. Now I’m sitting down and reading a paragraph or two, and then I’m either putting the book back on the shelf or in my to reread pile! My books, by default, have arranged themselves emotionally. At one end there are piles of books that I love unconditionally and will never part with. And at the other end there is a pile of books dusted in guilt, the books that have moved from house to house, still unread….but which I feel I *should* read. One day I will have the courage to give them away. And in the middle is a wonderful haphazard jumble of everything else. I love this, Lucy! Arranging your books emotionally–perhaps that should be my first step. Of course, then I would have to move to alphabetical order within the categories. Does this mean that if you have more than one book by an author, her books could be found in all three categories? Are all your books stacked horizontally on shelves in the order you read them? So to locate a book you have to think back to when it was you read it? I wish I could see a picture. This is cool if I understand it correctly–it’s like your own personal reading history. I wish I had such an organized system—I simply shelve mine, willy-nilly. I’m trying to get better about “releasing” books and trading them on Swaptree so I can eliminate some I doubt I’ll be reading again. It’s hard! Maybe the first step is wishing… : ) And much prefer the idea of “releasing” rather than giving away or getting rid of. Thanks for the swaptree idea. 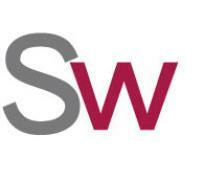 Here’s the link: http://www.swaptree.com/. I have two bookshelves, side by side, one with female authors, one male, each arranged alphabetically. I know this is very sexist of me, but that’s not how it’s meant, it’s just the way the books “called out” to be shelved. For the most part, books written by men and women are different, don’t you think? And I’m not talking about chick-lit, either, but high quality reads. I feel the tone–the vibration (if I can jump into my metaphysical self for a moment)–of a book written by a woman is different than that of a man. Not better, not worse. Just different. And some days, I’ll find myself being pulled over to my girls and others to my boys. There’s no rhyme or reason to it, I just go with the flow. And then from there, they’ll be a bit of a fight for my attention. I do find it a lot easier to get around my shelves, though. The boys have a little more space, but not by much, and if you count memoir, which is shelved in a different space, then it’s about even. At first I was thinking to shelve by gender is wild and crazy or maybe the opposite of wild and crazy. Then something started seeming familiar about it. I’m wondering if a long time ago I did the same thing. The more I think about this, the more intriguing it becomes. Do you separate the classics from contemporary fiction? Oh and a whole other calculation to make–I would imagine I have more books by female authors than male, but I’m not sure. I don’t separate the classics from contemporary…for instance Regina McBride’s The Nature of Water and Air is right next to Carson McCullers The Heart is a Lonely Hunter. It’s interesting who sits next to who…and then when a new book comes in how it changes up the mix. Your bookshelf seems like a very lively place, which is awesome! And I love a new perspective. I see now that when I reach for a book, I’m only looking at that book and not on the ones on either side. I will open my eyes wider. Lovely, lovely essay by Nicki Leone in Bibliobuffet, “The Box of Books My Mother Sent Me.” Here’s the link: http://www.bibliobuffet.com/content/blogcategory/29/193/. You can see pictures of Eden Tyler’s shelves in her house of books at http://edentylerwriter.com/2009/06/17/bookshelves/! Anyone else who’s put up pictures of their shelves, please leave a link. We want to see! To see a very cool slideshow of these paintings, go to http://www.pw.org/content/written_image_possession_obsession. One looks like it was organized based on color! Great to hear from you, Christian. Do any of the authors you read have a book in fiction and nonfiction? I file by size within topic. That probably makes no sense unless you could see a picture of my bookshelves, but it lets me have an attractive arrangement of my library and also lets me find any book I want in seconds without having to remember the exact title or author. If I’m looking for the field guide to dragonflies, I know it’s a medium-sized book on the bugs bookshelf. Works for me, not trying to push it on others, wish I could post a photo to illustrate. Shelving by size within topic–very interesting. I would love to see a picture. Do you have one? If you can email me the url, I can attempt to add it to the comments so everyone can see. Here’s the link to view cyberchuck’s book shelves. He uses the “size within topic” method of shelving. Worth a look for the cool pictures alone. Although we need to do something about the fiction shelf! Brilliant! I love British newspapers, all of ’em. Even the bad ones are good. As the US newspaper industry winds down, maybe we can all take out a subscription to The Independent, The Guardian or The Times and stay enlightened. Thanks for your comment, Cyberchuck. I’ve seen several interesting articles in the Guardian lately. Will keep my eyes on the other ones. 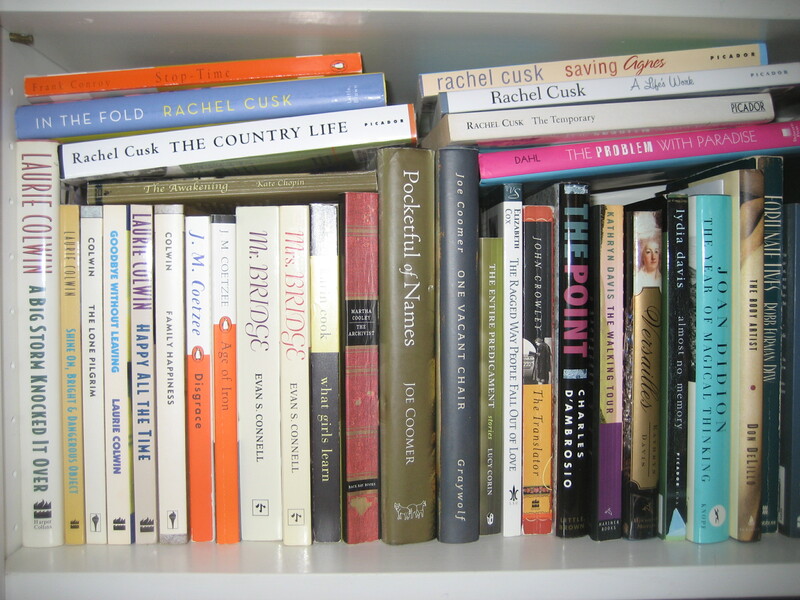 For a look at the English Professor’s bookshelves (Cyberchuck’s brother), follow this link: http://picasaweb.google.com/catchingdays/TheEnglishProfessorSBookshelvesCyberchuckSBrother#. I love the wall of books! It looks like you can pull a book off a shelf from anywhere in the room.